Home Carolynne Arts and Culture Gob Squad: War and Peace – Why War? Why Peace? Fiction, according to Tolstoy, can get you closer to the truth. But what should be asked is – “what is truth”? Gob Squad takes another seemingly basic concept under deeper consideration and asks: “why war?”, also suggesting that we could just as well ask: “why peace?”. By taking Tolstoy as their inspiration, Gob Squad in their production of “War and Peace” hold a witty conversation with us about conflict from the perspective of peace in the modern world. “War and Peace”, by Leo Tolstoy is considered a Russian epic. Written over one hundred years ago, it follows more than 135 characters over 1200 pages. No matter how “heavy” it sounds, Gob Squad condensed one of the greatest Tolstoy’s pieces of work into a less than two hours production. Those who expect a straight-adaptation, useful to understand and to get to know “War and Peace” without reading it, will feel a major disappointment. 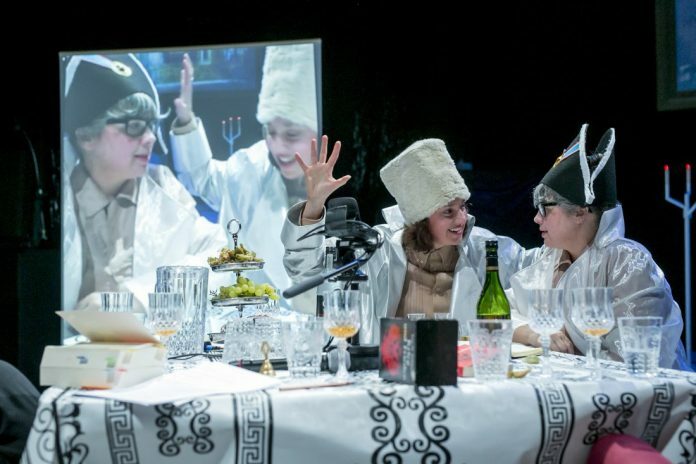 Although, they present some of the main points of the novel, the German-British collective flick through it in a live video performance by creating a salon like those in czarist Russia. They engage some people from the audience to sit with them, contemplate, and to be distracted. Gob Squad touches contrary topics such as life and death, and obviously war and peace, by asking what exactly those things are. But instead of giving a clear-cut answer, they leave an open space for decoding based on everyone’s specific experience of the production. They draw inspiration from Tolstoy by mostly focusing on history with the play set it in the modern day, where most of us can’t possibly imagine the reality – and normality – of war. We sit on the comfortable couches of ravaging peace, being constantly distracted. The word “distraction” itself is used many times in Gob Squad’s production. Apparently, this is a thing we can do best. In order to do it, the members of the modern salon – and we as the audience as well, as this salon isn’t only reduced to few chairs but expanded to the conception of the whole world – are watching some distractions. Some of the characters of Tolstoy’s novel are introduced in the fashion show style. The actors are literally acting by showing the performativity of personalities that we can identify ourselves with but mostly only on a superficial level. The performance is an attempt to reflect on the question of “if it is possible to live a moral life in an ethically imperfect world”, drawing on the issue of comfortable living inside capitalist consumption. We are also introduced to people such as a military prostitute and a military nurse, that no one normally thinks about in the “ethically imperfect world” of commodity fetishism. With Tolstoy in their minds, God Squad create an entertaining performance, full of meaning. Even though, it can be hard to find many connections between the production and the novel, you leave the theatre with many new questions about relations between history and our the modern day, that afterwards seems like the ultimate distraction.